Putting feel is a mysterious and elusive thing. You can have great touch on the first green and lose it by the second, unexplainably. 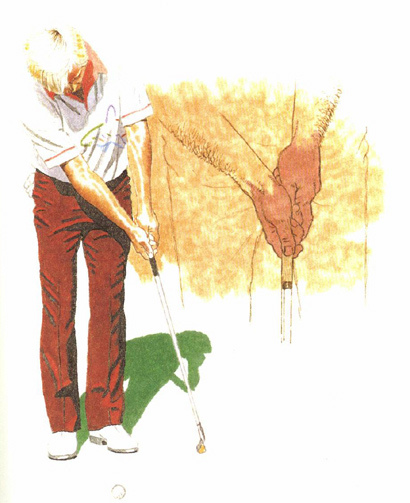 You can also have it on the practice stroke but lose it by the time you strike the ball. But in that case, I have an explanation. Most players - even most Tour pros - loosen their grip on the club after their practice stroke, then regrip as they settle in for the actual stroke. I think that's a bad idea. I prefer to do what Ray Floyd, Tom Watson, and a few others do - hold the hold. From the time I take my practice stroke to the time I hit the ball, my hands do not budge on the club. This is contrary to my routine on every other golf shot, where a certain amount of grip adjusting and 'pumping' take place as I settle in over the shot. The key is to make your practice stroke more than a wave of the putter. It should be a dress rehearsal for the swing, using exactly the same length and force of swing that you want to apply to the actual stroke. Then, maintain that hold on the putter and step into the real thing. The swing feel will still be in your hands.